This is an update on the previous article David's fight to take down the Goliaths in the marketing industry :A boutique agency's SEO Case study. 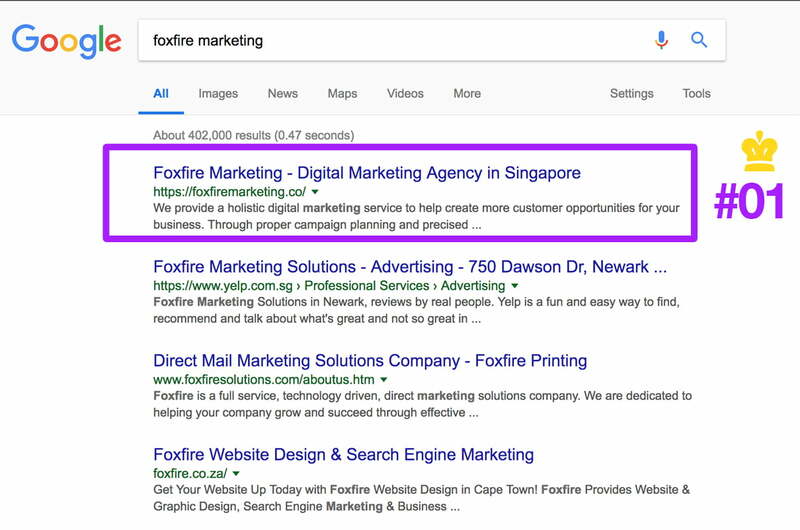 After a month of proper on-site optimization and off-site diversification, we are glad to say that Foxfire Digital Marketing Agency has officially ranked #01 for brand name keyword, "Foxfire marketing". So what's the big deal about that? Naysayers may say that it's easy to rank for a brand name keyword. 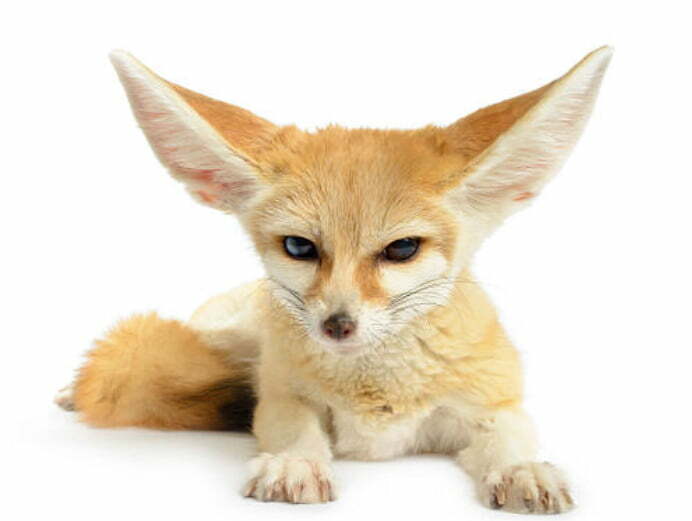 However, we beg to differ as this is despite the SEO sandbox and our site is barely 2 months old. What's more, there are TWO different marketing agencies with the same exact brand name. They are marketing agencies that conduct SEO and have aged sites that are naturally more authoritative to Google. So this is a scenario where ranking the first for your own brand name isn't a walk in the park. 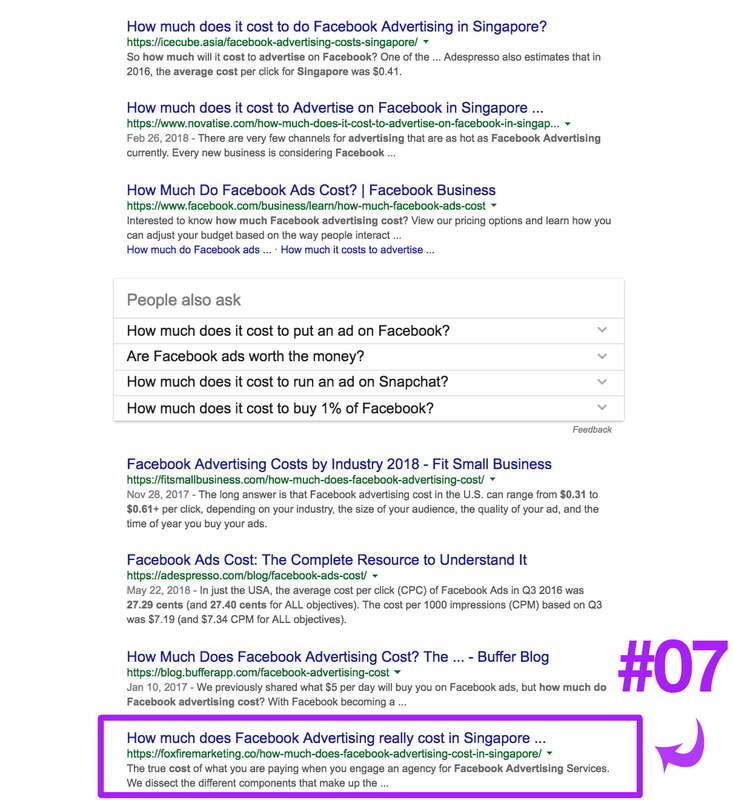 Another small win for the team is that we have also managed to rank a high purchase intent keyword "How much does facebook advertising cost in Singapore?" on the first page today. This is a really good signal that our site is slowly moving out of Sandbox and into the real competition with the local goliaths. This is a highly relevant keyword for customers near the bottom of a funnel. When someone is searching for your price, they are probably interested in your product. That's all for the 2nd update on this case study! Stay tuned for more updates on our results and if you have a new site and are facing the same exact problem, we get you. Refer to our SEO services to see if we can help!